More warning signs, better bike lane markings and highway reflectors will be added to the mile-and-a-half strip along Commonwealth Avenue through Boston University to improve safety in the wake of the death of a student cyclist in December. Those improvements, recommended by a joint BU-city working group, will be made by the city of Boston. Safety advocates, including Craig Hill, chairman of BU’s Bike Safety Committee, commended the measures, while cautioning that additional improvements may be necessary in the future. 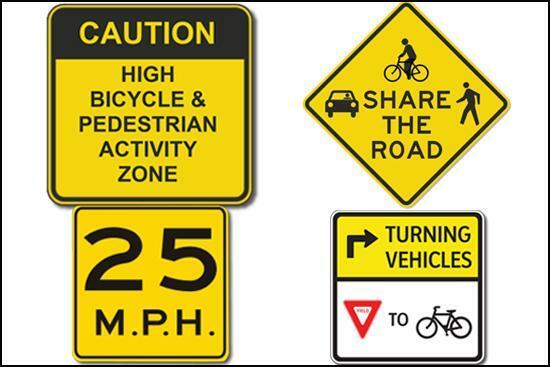 Signs: New signage will designate a “High bicycle and pedestrian activity zone,” and instruct drivers to “Share the road” and “Yield to bicycles when turning right.” Other signs will post a 25-mile-per-hour speed limit. Part of the stretch had been posted for 30 mph. Pavement markings: The existing bike lanes, installed five years ago, will be painted at intersection crossings with skid-resistant, high-visibility green paint, and white bike-shared-lane markings will be added within the green paint at busy intersections and at long crossings. The width of the bike lanes’ edges will be increased to six inches, from the present four inches. Reflectors: Highway reflectors, recessed into the pavement, will be installed along the outside of bike lanes between intersections, and more closely spaced before each intersection crossing. Hill, associate vice president for auxiliary services, says the improvements “will result in more clearly defined bike lanes, especially at night, and raise the awareness of motorists that this corridor is a high pedestrian and bicycle area. David Watson, a Metropolitan College lecturer on city planning and director of the advocacy and safety group MassBike.org, also touts cycle tracks as a possible project for a “major redesign” of Commonwealth Avenue. Meanwhile, he says, the agreed-to improvements “sound like they will help remind motorists to look carefully for bicyclists along Comm Ave. If the city is actually reducing the speed limit from 30 to 25, that will increase safety for everyone by giving drivers more time to look around and react to the people around them, and will help reduce the severity of injuries” in crashes." Two students died last fall in cycling accidents. Christopher Weigl collided with a tractor-trailer at Comm Ave’s intersection with St. Paul Street, and Chung Wei Yang was hit and killed by an MBTA bus at the intersection of Harvard and Brighton Avenues in Allston. This program aired on March 18, 2013. The audio for this program is not available.